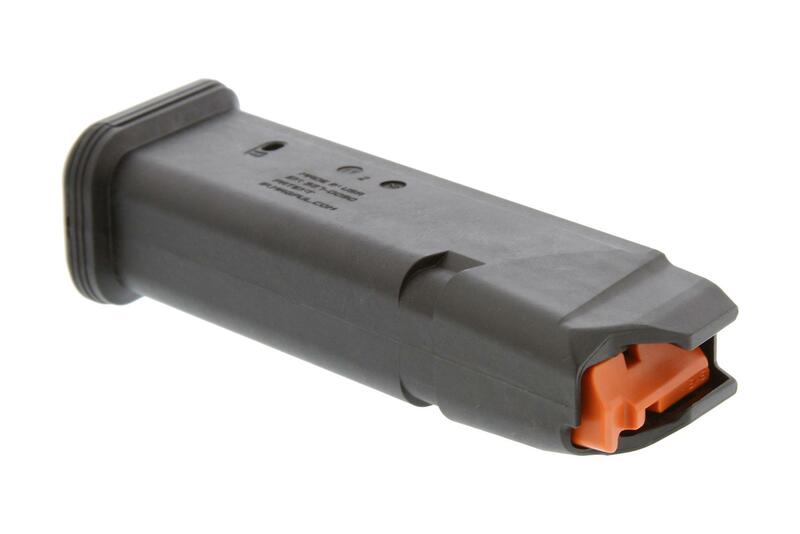 The Magpul GL9 PMAG 17 is a 17-round Glock 9mm handgun magazine featuring a proprietary all-polymer construction for reliability and durability over thousands of rounds. High visibility controlled-tilt follower, stainless steel spring, easily removable floorplate for cleaning, paint pen dot matrix for mag marking, ridged floorplate edges for better grip, and 17rd indicator windows. Drops free loaded or unloaded. All with the same boring reliability you expect from an OEM magazine. 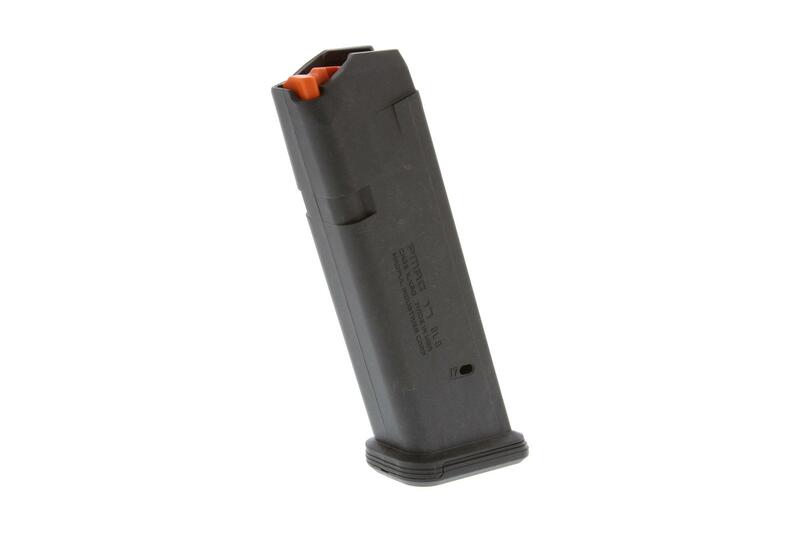 NOTE: The PMAG 17 GL9 is compatible with all full-size 9mm Glock handguns, as well as compact and sub-compact variants with some protrusion below the grip. May not be compatible with other platforms designed for use with Glock magazines. <br>One, the more use they get, the less frequently they tend to lock the slide on an empty chamber. Two, either the dimensions are slightly off or the polymer used in the mag body is causing a great deal of friction compared to factory mags because after a moderate firing schedule they tend to not want to drop free and need to be ripped from the mag well. It's a good practice in general but not conducive to speed for competition or what have you. <br>The slide lock issue seems to be partially mitigated by using 124gr/NATO-spec 9mm and foregoing the use of WMLs or comps. For range use/stockpiling, the price is right. Great price, great quality, great mag!!! I will buy more. It's a PMAG!! AND IT"S BETTER THAN OEM!! Smooth as butter. FAR better than Glock OEM mags. AND CHEAPER! Works good in both my G19 & G17. No issues at all. Not having witness holes is kind of different, but it doesn't matter. They work nonetheless. Good inexpensive alternative to stock Glock mags. I'll definitely order more. Picked one up for a JR Carbine and it ran great without any issues. Quite please by this, I'll be ordering some the higher cap. mags now as well. PA is awesome, what more to say! Picked one up over the holidays from PA to test in a Just Right carbine and had no problems at all. I only ordered the one 17 rounder since I wanted to ensure they would function since I know from there has been some history with JR and mags in the past. Glad to report it ran flawless with some blazers, pmc, and federal. Will be ordering some of the other higher capacity mags on my next order for sure. Great mags, great customer service! These pmags are great. They honestly feel better than factory when insterted, and are with out the need to smack the bottom to get them in all the way. They seem to pop into place with less force and more substantial of a "click" letting you know the mag hold/release has secured it in place. Releasing the pmags is great as well, quick and smooth. No feed issues, just as you would expect from any pmag. Most importantly, Primary Arms does it again with great communication and super fast shipping. Just as every order I have placed it shipped out the next day and got to me in minimum time! Nice mag for the price. Good fit and finish. No individual round counter like Glock mags just hole to indicate 17th round. Tested in G35 conversion to 9mm. Loaded to 17 rounds OK. Inserted OK with full mag and one in chamber. First round fired but stopped on FTE. Cleared and fired all 17 rands no failures, two more full Magpuls no failures with 17 rounds loaded. Maybe when spring compresses a bit they will work with 17+1. Will buy more. Decent price for Name brand magazine. Work great. Would have bought more at that price if they wouldn't have had a limit. The question was do they work as good or better than a Glock magazine. So far so good, I have not had any issues. It's a matter of time though, how will they work after a few thousand rounds and a year from now? 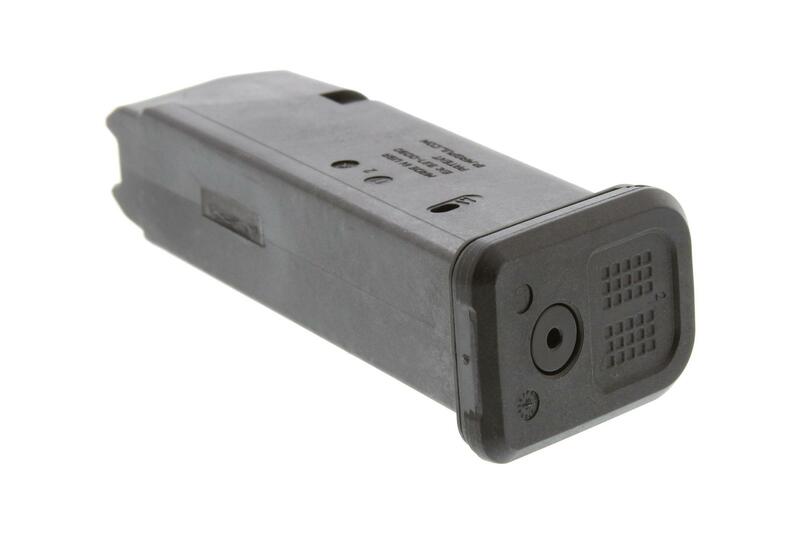 Those questions will be answered in time but right now, right now they work as well as a Glock OEM mag. I tried out these Glock PMAGS for the first time in a I.D.P.A. match. They ran flawlessly. At $10 cheaper than factory Glock mags the only question is How many I will own. 10 so far is a good start.As always primary is the greatest. Prices are amazing and shipping is cheap and fast! I have just started using them but so far so good on the performance no issues with feeding and loading. Only time will tell if they become a five star rating. Great quality - seats and drops without issue. I've beat this thing up pretty good with torture tests and have yet to experience a function issue. Will buy more. Received the post recall mags. They look good and I plan to run them in a G19 and G26. Thanks PA.
Great magazines for someone on a budget.. I use them for shooting at the range so that I don't have to constantly unload my carry ammo/hollowpoints out of my factory glock magazines.. I have over 800 rounds through 4 examples with no malfunctions.. Great buy!! I set myself up to be notified the minute these came available. I ordered 2 and they shipped and arrived quickly. Really nice polymer and quality spring, follower, and base plate. 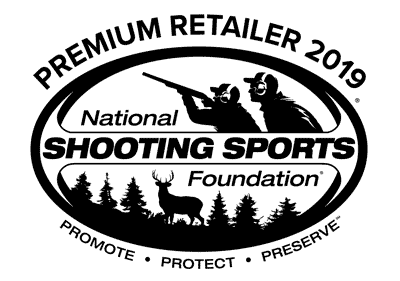 Days after arrival Primary Arms notified me of the Magpul voluntary recall and Primary Arms even offered to fully refund the order if I wanted to send them back. I kept them, but wanted to say how impress I was that they took the initiative.